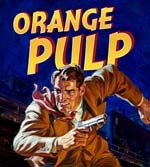 Syracuse University Library’s Special Collections Research Center (SCRC) will feature the exhibition “Orange Pulp: The Pulp Magazine and Contemporary Culture.” The purpose of the exhibition is, first, to showcase the University’s world-class collection of pulp magazines and pulp paintings—starting with the acquisition of the Street and Smith archive in 1967, and continuing through the acquisitions of the A. A. Wyn (Ace Books), Hugo Gernsback and Forrest J. Ackerman collections—and second, to examine pulp culture by re-creating the worlds of the publishers, writers, artists and readers who promulgated it. An opening reception will be held at 5 p.m., Wednesday, Jan. 26, on the sixth floor of E.S. Bird Library. The exhibition, which spans two locations, will be available from Jan. 25-June 17. On display in the sixth-floor SCRC gallery will be pulp magazines, notably titles like Weird Tales and Amazing Stories; the typescript of Isaac Asimov’s “Strange Playfellow,” which introduced readers to one of science fiction’s best known characters, Robbie the Robot; and correspondence with figures like Ray Bradbury. The SCRC gallery is open on Monday, Wednesday and Friday, from 9 a.m.-5 p.m., and on Tuesday and Thursday, from 9 a.m. to 7 p.m.
SUArt Galleries in the Shaffer Art Building will present a profile of pulp artist Norman Saunders (1907–1989), including 10 lush and dramatic Saunders paintings from the University collection. SUArt Galleries is open Tuesday-Sunday, from 11 a.m.-4:30 p.m., and Thursday, from 11 a.m.-8 p.m.
Gary Shaheen, a senior vice president at the University’s Burton Blatt Institute and a lifelong collector of pulp magazines, co-curated the exhibit. Kingma, Inc., which is owned and operated by Bruce and Susan Kingma, sponsored the exhibit and its accompanying guidebook.